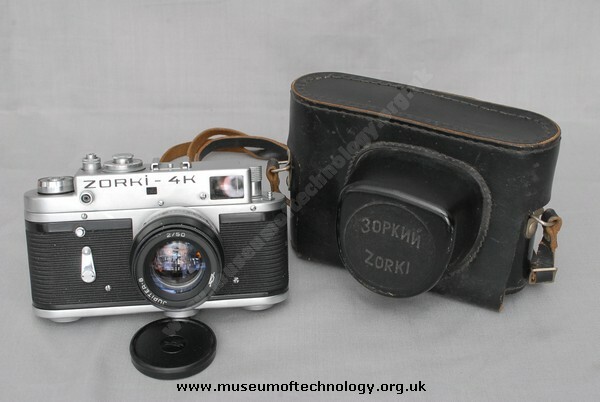 Zorki (Russian: Зоркий, meaning sharp-sighted) is the name of a series of 35mm range finder cameras manufactured in the Soviet Union between 1948 and 1978. I have owned a couple of Zorki cameras, and a Zenit plus 85mm f2 Helios lens. Unconventionally, I also regularly used the f3.5 Industar lens from one on an enlarger for b&w printing. The Russian cameras may not be as silky smooth, or as aesthetically pleasing as their Japanese rivals, or have as many "whistles and bells", but they were very capable instruments. The Zenit would have benefitted greatly from an instant return mirror. My late father-in-law decided to take up photography and began buying cameras from the small-ads. One was a Zorki-4K. On showing it to me I suggested putting a roll of film in it. "Oh no!" he said, "I cannot see through that tiny viewfinder." I bought it off him for the 20 quid he had paid. After running a film through it, I was surprised at the quality of the resulting prints. Later, using Black-and-White, I discovered better quality still. It seems from what I have read that the Zorki lenses (35mm f2.8/50mm f2/85mm f2) are copies of the pre-war Zeiss lenses made for the Contax camera that was the rival to the Leica. Thus their lens elements have been computed in a certain way for monochrome film and the Zorki lenses show best results with such films.